In my search for the former Victorian and Edwardian elegance that once made Bray the ‘Brighton of Ireland,’ I found myself last weekend on the site of the once elegant and imposing International Hotel, that stood on the corner of Prince of Wales Terrace, facing the railway station that was built for William Dargan. The International Hotel was designed by Edmund William O’Brien and when it was being built in the 1860s it was said this would be a ‘monster’ hotel ‘on the most extensive plan of American hotel accommodation.’ The hotel was built for John Brennan, who made his fortune in America before he returned to live in Bray. The new hotel complemented the elegant Victorian terraces Dargan had recently built on each side of Quinsborough Road, and completed his plans for developing this part of Bray as a resort. The first stone was laid on 18 February 1861, and it took18 months for a workforce of 100 artisans and labourers to complete the new hotel. The hotel opened on 31 May 1862, and was named after the International Exhibition which opened in London at the same time. The new hotel was built on a grand scale, and cost Brennan £30,000. When it opened, it was the largest hotel in Ireland at the time. It stood three storeys over basement, and had 250 rooms, of which 212 were bedrooms. It was said it could accommodate 300 to 400 people. At the time there was no such thing as en-suite rooms, but each storey of the new hotel had plenty of bathrooms and WCs. The hotel was designed by the builder and architect Edmund William O’Kelly, who was actively working in Bray from the1840s or earlier until the 1860s. O’Kelly was also involved in building the Turkish Baths on the opposite side of Quinsborough Road. O’Kelly was also the architect of three Roman Catholic churches Co Wicklow: Avoca, (1862), Newtownmountkennedy (1863) and Greystones (1866). However, there is some confusion about his name, and he appears in the Irish Builder and The Builder variously as Edmund William O’Reilly, EW O’Reilly, E O’Kelly, Edward O’Kelly and EW O’Kelly. His various addresses in Bray included Erin Cottage, Main Street, and Nos 1 and 2 Prince of Wales Terrace, Quinsborough Road, (1863), and Kilbride Road (1869). As Edmund William O’Kelly, he signed contract drawings for Bray court house in 1841, but as Edmund William Kelly he signed his designs for work in Enniskerry, Co Wicklow, around 1856. EW O’Kelly, builder, is listed among the tradesmen of Bray in the Post Office Directory in 1853 and 1857 and in Thom’s Directory for 1863, which also lists Edmond O’Kelly, of Erin Cottage, Main Street, in its list of ‘Nobility, Gentry, Clergy, &c.’ and Edmond William O’Kelly, Esq, at Nos1 and 2 Prince of Wales Terrace, Quinsborough Road, in the street directory section. In the 1869 edition, however, O’Kelly is no longer included among the gentry and the professional classes in Bray, and he appears simply as EW O’Kelly, builder, Kilbride Road. By 1874, he is no longer listed in the directories. The directory entries suggest that in the late 1850s and the early 1860s, O’Kelly’s standing was enhanced by the opportunities provided by Bray’s building boom but that he suffered a reversal in his fortunes later in the 1860s. The other great hotels in Bray dating included the Royal Hotel, which was first built in 1775 as Quin’s Hotel. George Wilkinson designed the Royal Marine Hotel on the Esplanade in 1859, the Esplanade Hotel was built in 1860, the Strand Hotel later opened in a house once owned by Oscar Wilde, and the Bray Head Hotel was built in 1862. 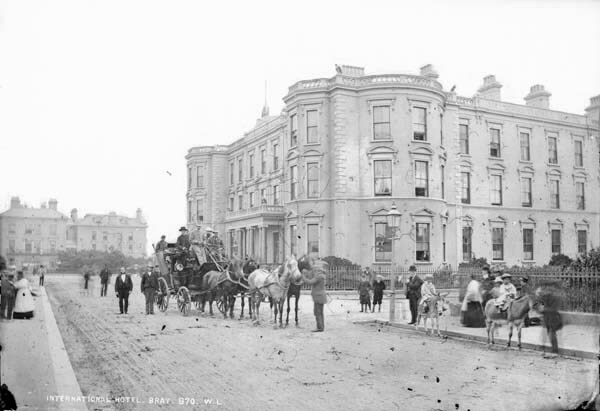 From the day the International Hotel first opened its doors in 1862, it was one of Bray’s best-known landmarks and by the beginning of the 20th century it was a thriving hotel was in its prime. Bray began describing itself as ‘the Gateway to the Garden of Ireland,’ and the hotel’s one great bonus was its location in front the railway station. However, the hotel had a rocky start in life, and the proprietors changed at least three times in the 1860s alone. In 1900, the International was bought by the Bethel Hotel Company, which also owned the Bray Head Hotel and the Marine Station Hotel. In the same year, Breslin’s Royal Marine Hotel was bought by the Dublin, Wicklow and Wexford Railway for £14,000, with plans to remodel it ‘on modern lines as a station hotel’ to designs by James Joseph Farrall. But Bray was not developing as a holiday resort in the way Dargan hoped for, and his expectations for sustained tourism were never realised. World War I finally brought an end to the hopes that Bray could be developed as the Brighton of Ireland, and the International’s life as an hotel came to an end, not for the time first time. The British Red Cross and the Saint John’s Ambulance Association leased the International Hotel in 1915, and it would not reopen as an hotel for another 30 years. In July 1915, it became the Princess Patricia Hospital for Wounded Soldiers, named after Princess Patricia of Connaught. It contained over 200 beds. Initially it was used for fitting of artificial limbs and for convalescent cases from the Dublin hospitals. Later it was used for more general war-wounded. In the decades after the war, Bray declined as a tourist resort and the large and imposing International Hotel was left empty. When the Princess Patricia Hospital closed in 1919, the hotel’s owner, Frank Bethell, returned, but the International Hotel did not reopen. All the furnishings were sold at auction on 14 February 1921 and the hotel remained vacant from 1922 to 1935. For more than a decade, the first sight greeting sightseers and visitors to Bray in the 1920s and the 1930s as they walked out of the railway station was the International Hotel in a state of neglect and its overgrown gardens. Close by, the Marine Station hotel was also derelict. This sad state continued until 1934, when the Friendship Holiday Association, which grew out of the Workers’ Travel Association in London, took over the International in 1934 and ran the hotel from 1936 until 1939. With the outbreak of World War II, Bray became a garrison town once again and the Fifth Battalion of the army was based in the International Hotel. When the war ended, the International Hotel was put up for sale once again in 1946. It reopened in 1947 under the management of JW Oppermann, but this was yet another short-term arrangement, and in 1950 the hotel was put up for sale at auction as a going concern, fully-furnished and equipped. However, the hotel did not sell until 1961, when it was bought by the Abbey Group. Following extensive renovation and refurbishment, it reopened on 2 June 1962. But within two years it was back on the market in February 1964 with an asking price of £90,000. It did not sell, and was withdrawn from the market. By the mid-1970s, I was working for the Wexford People group of newspapers, where I was designing the front page and some of the inside pages of the Bray People. Early on 14 June 1974, fire broke out in the International Hotel. All the resident guests managed to escape, but the whole building was ablaze within hours and the hotel was burnt out. Meanwhile, Princess Patricia of Connaught who had given her name to the hospital once housed in the hotel, had died earlier that year. She was born Princess Victoria Patricia Helena Elizabeth on Saint Patrick’s Day 17 March 1886, and was a daughter of Prince Arthur, Duke of Connaught, and a grand-daughter of Queen Victoria. She gave up her royal titles when she married Alexander Ramsay in 1919, and became known as Lady Patricia Ramsay. She died on 12 January 1974, six months before the fire. The building and the site were left derelict for almost 20 years. Inside, the magnificent staircase and a piano could still be seen for some years after. Eventually, the building was deemed unsafe, and what was left was demolished. In 1980, the developer Sean Nolan applied to build two apartment blocks on the site, but this plan never went ahead. Finally, in 1990, Bray Leisure Bowl was built on the site. Some of the original Victorian wrought-iron railings can still be seen on the site. But another part of the elegant Victorian streetscape of Quinsborough Road in Bray has been lost for ever.